*Vanessa James and Yannick Bonheur of France on Monday became the first black couple in history to compete in Olympic pairs skating. The couple met each other three years ago through an Internet site for competitive pairs skaters seeking partners. “I didn’t search for a black girl in the first place, just a girl who wanted to try and work for it,” Bonheur, 27, told reporters, according to Reuters. James, 22, was born in Canada, but competed for Britain as a single. She was granted French citizenship last year. She said her performance with Bonheur at the Winter Games showed the door had finally been opened for black pairs skaters. Although the duo finished in 14th place, their series of high-flying jumps and high-risk lifts made them crowd favorites at the Pacific Coliseum. 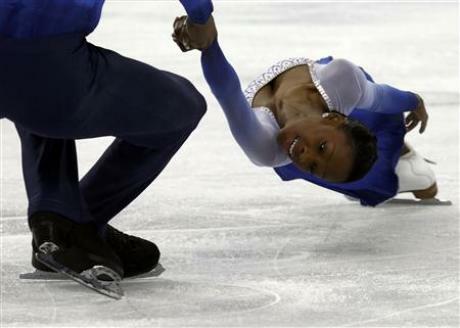 Previous black Olympic skaters competed as singles. Debi Thomas of the U.S. won a bronze medal at the Calgary games in 1988, and Surya Bonaly of France competed in three Olympics in the 1990s. Below, Vanessa James and Yannick Bonheur skate to Bjork’s “Oh So Quiet” at Courchevel Galain in 2009. Well one half of the bronze medalists in the pairs figure skating competition from Germany was Black also. This is indeed historic, but let’s not forget the German brotha. They look beautiful!! I hope I can find this on YouTube. Oh, EUR, merci beaucoup for posting this video!!! I guess I haven’t been paying attention because before yesterday, I had NEVER seen a black woman OR black man on ice skates in a professional competition before! The other contestants must have REALLY been good, if these kids came in 14th place!!! Dreams aren’t limited! Seeing this video made my heart jump with joy!